Getting in a car accident is often loud, scary, and can be very painful with long term effects. Most people become most concerned with their vehicle, or their insurance, rather than their body and their health. Here are some things that I recommend people do after a car accident. It is always best to call the police and file a report immediately after an accident in an effort to set the facts straight. Many people think that by getting an accident report, that their insurance will go up. This is only a possibility if you file a claim to fix your car, (and not in all cases either). Many policies offer accident forgiveness, and will not necessarily raise your rates. I have seen cases where the two people involved in an accident agree to exchange info, and fix their cars on their own, only to find out that a police officer showed up after one of the parties left, and then cited that person for leaving the scene of an accident, and it cost her a hefty fine. Hence why it is always best to be there to state what you believe happened. If your car has sustained significant damage, call your insurance company to notify them of what happened. They will help you get things taken care of to limit your out of pocket expenses. 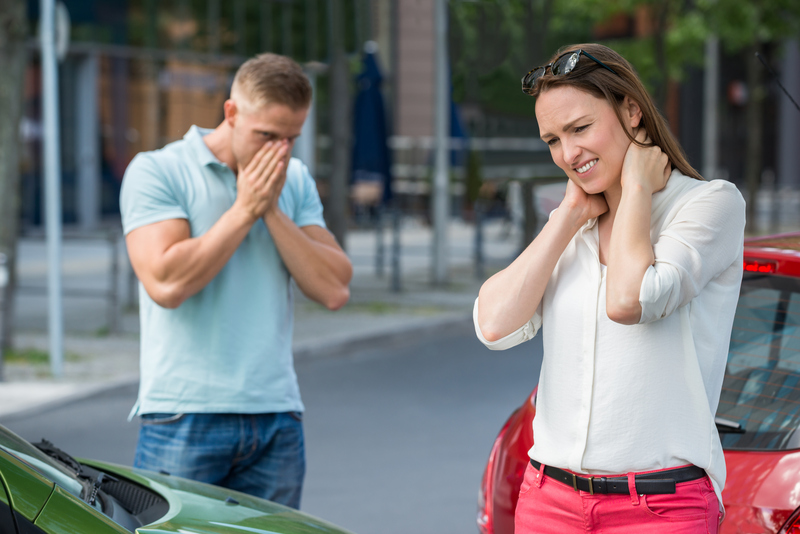 If you are hurt, tight, sore, or think you may have sustained any injury, call our office, for chiropractors who are proficient in dealing with whiplash relate injuries. Proper examination and treatments can lead to better healing and reduce the effects of whiplash, instability, pain, and future degeneration AKA arthritis. Many times people will feel sore, tender, or even worse they may not feel any pain at all… for the first few days or weeks following an accident. Many people do not experience pain or limited motion until a month or two has gone by, and they also fail to connect those symptoms with their accident. Headaches, neck pain, back pain, radicular pains, numbness, or tingling into the fingers arms, or legs and feet, shoulder, arm, knee and ankle pains, even jaw or TMJ symptoms are often signs of whiplash related injuries. Whiplash is identified as stretching or tearing of the soft tissues in the body such as ligaments, tendons, and even the discs which can be stretched, torn, bulged, or herniated in an accident. It can take only 5 miles per hour of an impact to cause a whiplash injury in some people. Most cars these days are designed to absorb the impact of small crashes, and not show much or any external damage, yet the forces are distributed to the people and contents in the car. Please get properly checked. Florida law requires people to seek a medical examination including chiropractic within the 14 days following an accident. Failure to do so, can and often gives insurance companies the ability to avoid their obligation to pay for medical bills including: MRI’s, chiropractic care, physical therapy, X-rays, or hospitals bills. Over the course of care, these costs can add up, so it is best to have your insurance company help pay for care for bodily injuries. Depending on the policy and specific situation, care may be a small percentage to no cost to the patient. We can check and verify what coverage you may have regardless of who was at fault. Florida is a No Fault state, so if you have car insurance, you should have coverage for medical expenses even if you caused the accident. If you are not at fault in the accident, you may want an attorney to help you recover money for lost wages, pain and suffering as well as future care if there is a permanent injury or impairment determined. We have been treating accident victims for almost 2 decades and know how to properly determine impairment ratings to make your case and settlement accurate so your attorney can fight hard for you. Building a strong case cannot be done by one doctor alone, and that is why we work well with orthopedists, pain management doctors, as well as surgeons if the need arises. There are thousands of attorneys in South Florida, but we work with a handful of honest, hardworking, yet tenacious lawyers who will get you every penny you deserve. Once the extent of your injuries are determined, we can and will refer you to one that will suit your needs. Some of the popular call centers or law offices you may hear on the radio, or TV, are popular and promise you thousands or even millions of dollars, may be good, and some may not be. It is hard to tell the difference just from an ad. We know who will have your best interest in mind, and help you the most, rather than treat you like a number. We hope you and no one you know is involved with a car accident, but if it should happen, we are here and ready to help. We have helped many people in Parkland, Coral Springs, Margate, Coconut Creek, and Deerfield area who have been in a car accident.